I hope that the fermented fruits of our efforts have and will be part of the festivities enjoyed during this special season of family, friends, celebration and reflection. We received wonderful news on Christmas Eve that a #11 grandchild will bless our family next year. A complete football team, Oh my! Who knew I would need a winery just to support the ultimate needs of my family. Hopefully, there will be a future wine maker in the bunch. While I am on the topic of good news, I entered our two reds in a wine competition last fall. I have always been hesitant to do so for many reasons. Aside from the issues with shipping wine, typically these competitions ask for numerous bottles to be submitted per entry. I always speculate that the process was also about stocking the personal cellars of the judges. Over recent years, I have been encouraged by COOP members to enter our wines in a judged competition. So, around the September timeframe I entered both reds in the Artisan Awards of San Francisco. It has become a known annual competition that showcases traditional made products from producers all around the world. In this forum, winemakers and wineries enter their top brands and compete for Gold, Silver and Bronze medals. Select hand-picked judges perform a blind tasting of all products submitted. Since we utilize northern California grapes, I liked the fact that it was a westcoast California event putting us up against high-end competition. I entered one red from each of our first two commercial years. I sent two bottles of our 2012 Zinfandel blend, earning a Gold medal, and two bottles of our 2013 Cabernet Sauvignon blend, earning a Silver medal. Needless to say, I was pleased and proud… and I think you will be as well. In my last update, I mentioned that the MA Winery Association has a wine shop in the new indoor market that has grown to represent about 30 Massachusetts wineries. Forgive me to mention it again, but why not? 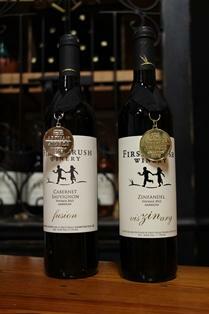 First Crush wines are outselling all other wineries. Hard to say if this will last, however, it’s a great proving ground for us and a great opportunity to showcase our products off Cape. Our 2015 Sauvignon Blanc (Star Spangled) and our 2015 Rosé (Innocence) are back in stock. Also, I have a limited supply, 120 cases, of a new 100% Sangiovese (Rapture). All three are tasting exceptionally wonderful. Once again, I thank the Lanza and Musto families for their support of us, their friendship, and their growing and shipping experience in supplying us with exceptional products. I guess this will continue to be a monthly rant… please fulfill your 2014-15 COOP wine reserve. I have your wine and I fully understand if you are in an off Cape location, but all others need to contact me regarding your reserved wine. In regard to our next 2015-16 COOP… it’s alive and well with new first-time members joining after learning about our unique opportunity. Not a week goes by without one or more new members. There is less than one week to go for past members to collect their signup incentive for joining 2015-16 before January 1. Just an email or a call can accomplish a reserve request, and your deposit can come later in 2016. We it comes to weather and football, when you live in New England, you learn to plan in advance. Just in case, the Saturday between the end of the football playoffs and the Super Bowl, January 30th, 4-6pm, is our next social. We hope you can warm the winery with your presence . Always feel free to bring guests. Cajun Bob and company will once again entertain us with his musical talents. As in the past, a small fee will be incurred to cover costs of the entertainment and our award winning wines. You guessed it, couples are asked to bring a small appetizer and singles can mooch. It has been a busy and productive winemaking season. Not only have we been making 2015 wine, but we have been bottling, at any opportunity, the remainder of 2014. I am pleased to report that we are months ahead of last year’s progress in regard to bottling, and in addition, our efficient racking process allowed me to get our reds into oak aging about one month sooner than last year. And you thought only wine gets better with age! As a a result, we are entering the only respite time in the wine making season. Still lots to do, but we can do it when we can do it. You may not be surprised to learn that Yogi Berra inspired me! One of our members is having a family group of 13 for a catered sit-down dinner at the winery mid-January. If you’re interested, all you have to do is reserve a date, and we do all the rest. We have a great chef, and rumors have it, we have great wine. 2015 was a turning point for First Crush. Our past has always been great, but 2015 was exceptional. Elaboration is unnecessary, but simply, we have become known, we are a ***** destination, we have many admirers, and from where I sit, it is all positive. I want to thank all for your continued support and enthusiasm. For those that assisted with wine making events, a special thanks. Diane and I want to wish all our COOPeratives a very Happy and Healthy New Year.